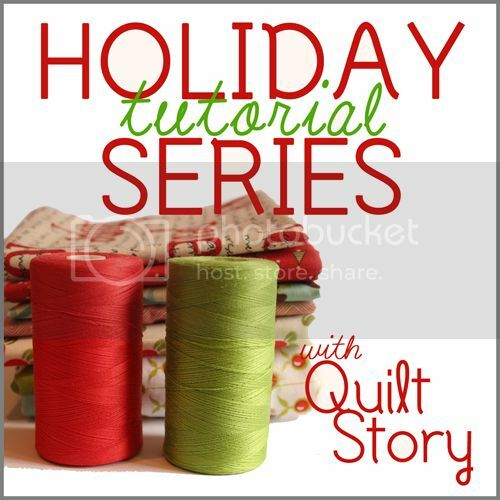 In case you missed my post yesterday over at the Quilt Story blog for their Holiday Tutorial Series, I'm reposting my tutorial for this Christmas bunting. 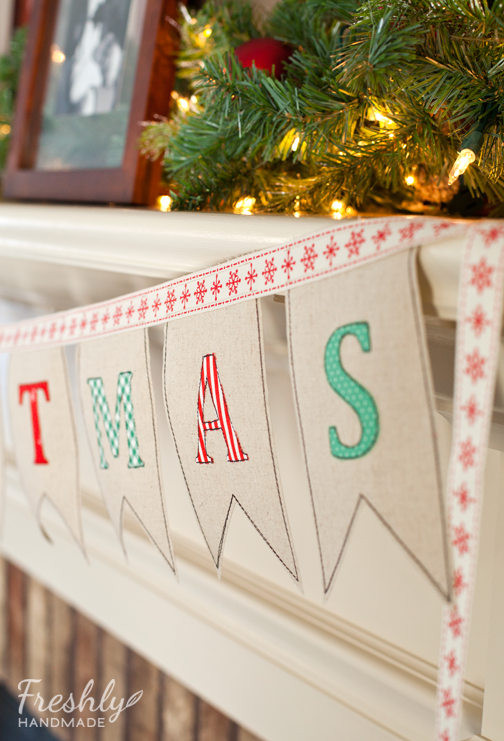 It's the perfect decoration for your fireplace mantel or just hanging on the wall. Please enjoy! 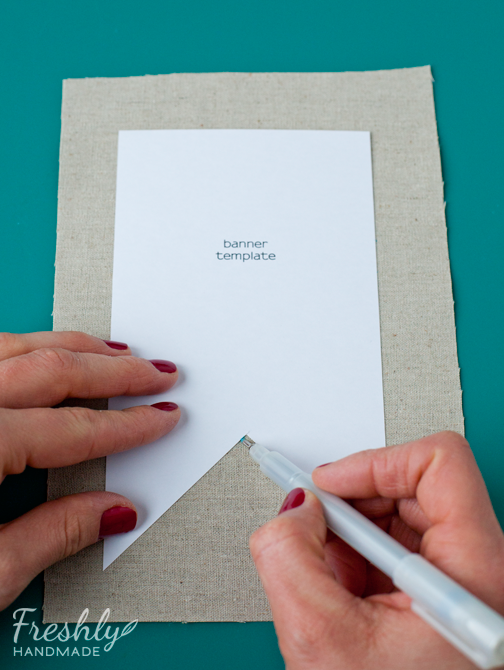 STEP 1: Click on the image below to download the template pages. Print page 1 on either copy paper or white card stock. I recommend printing page 2 on card stock since it helps to have a stiffer paper for the banner template. STEP 2: Lay a piece of fusible web, rough side down/paper side up, on top of the template page. 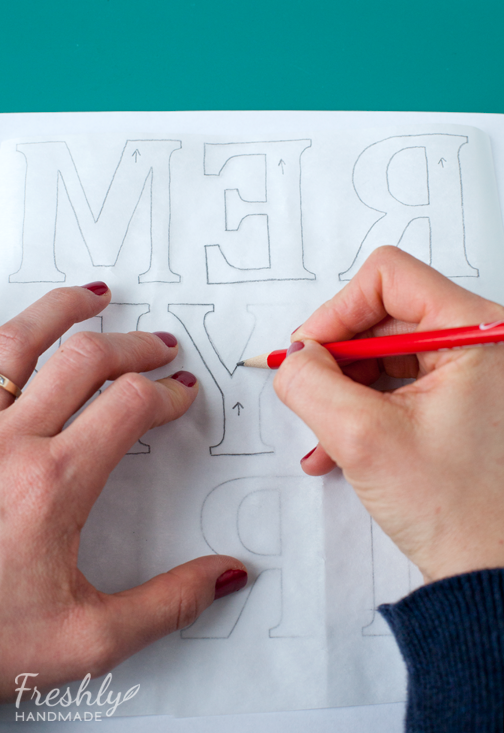 With a pencil, trace all the letters, as well as the holly leaves and berries, from pages 1 and 2. It's a good idea to identify the direction each letter should be by marking them with an upward arrow. Some are more obvious than others. No need to trace the banner template on page 2. 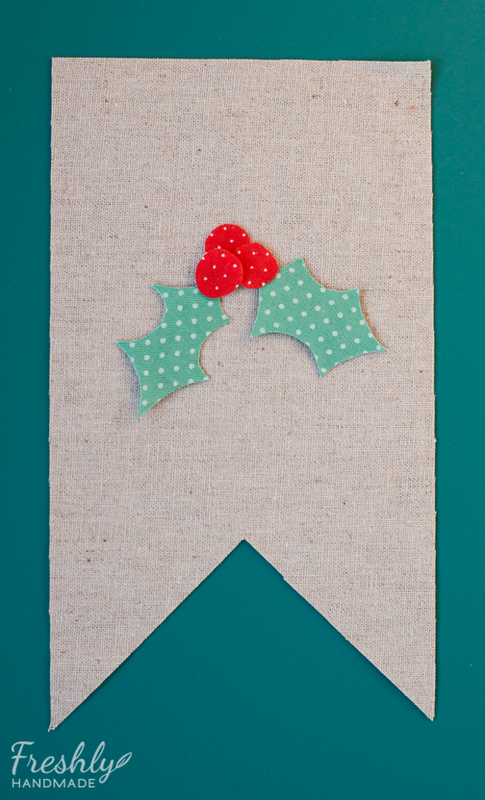 STEP 3: Cut out the letters, holly leaves and berries outside the traced lines. 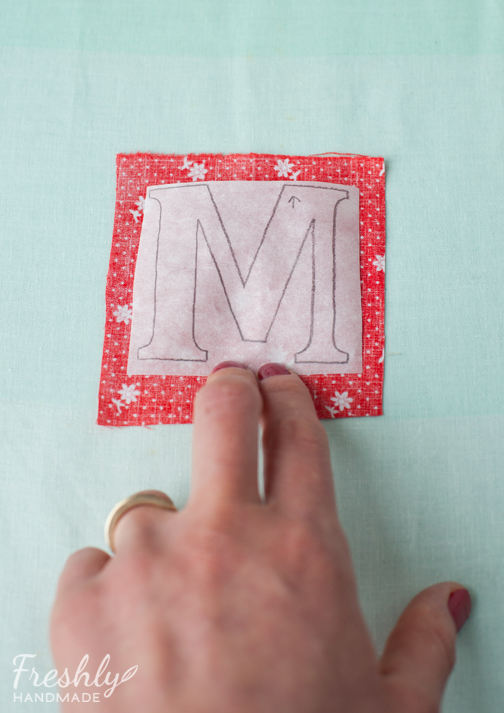 STEP 4: Place each letter on top of the fabric print you've chosen. You must place the rough side of the fusible web onto the wrong side of the fabric. 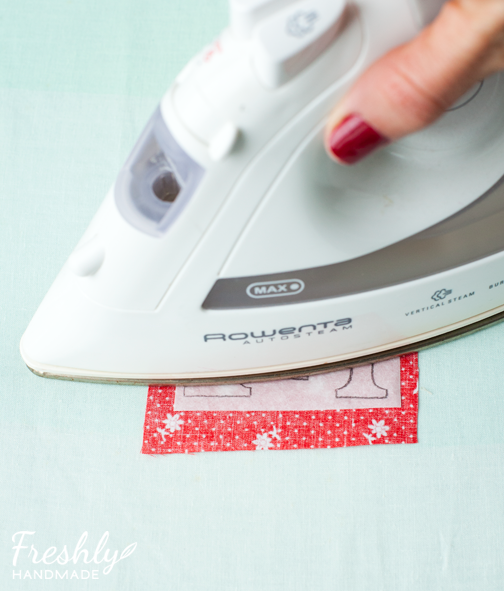 STEP 5: Fuse the paper and the fabric together using your iron and the manufacturer's instructions for the fusible web. For Wonder Under, I use the wool setting with no steam. I press in 8-10 second intervals, two times. Let cool. 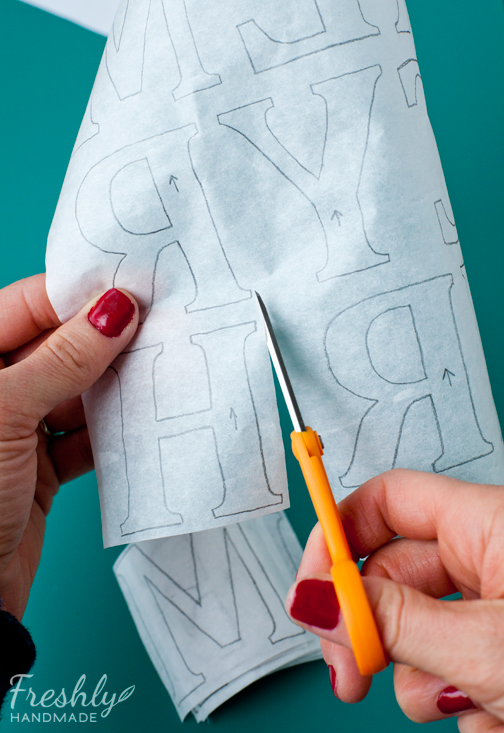 STEP 6: Using your small scissors, cut out the letters, leaves and berries along the pencil line. STEP 7: Go back to page 2 of the template and cut out the banner template along the black lines if you haven't done so already. 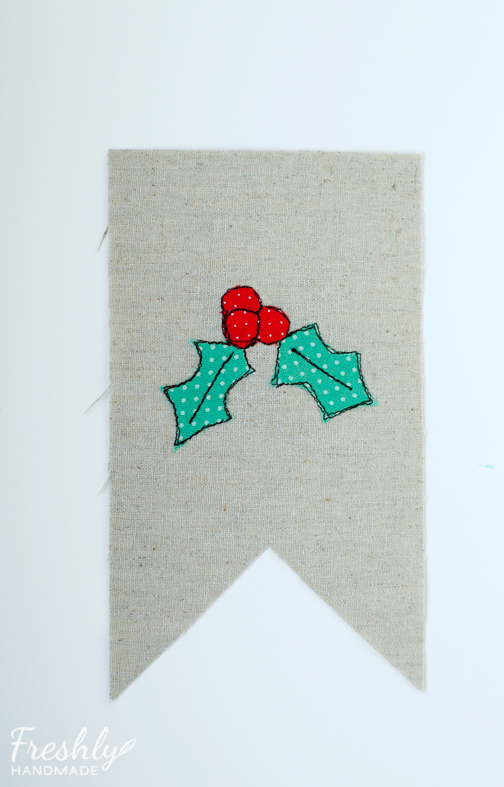 Using an ink or water soluble pen, trace around the banner template onto the linen fabric and cut it out. 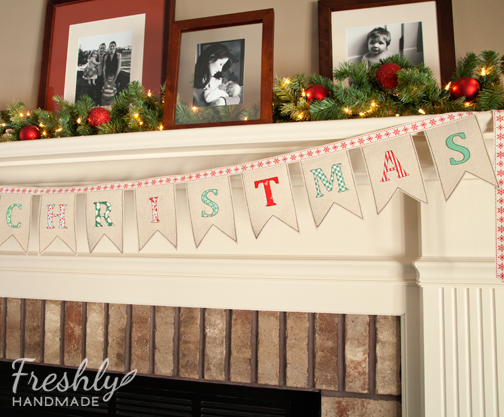 Make 15 banners. 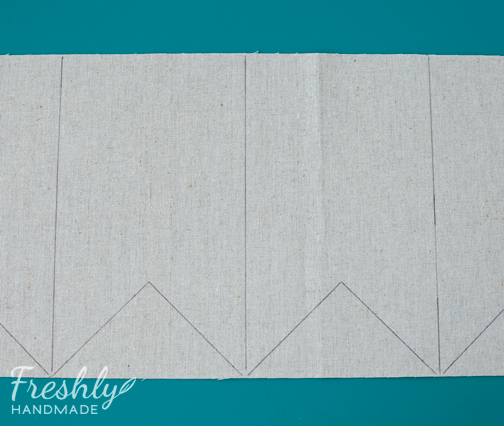 If you have yardage instead, cut 7" wide pieces and place the template in a row as shown below. This is a big time-saver. 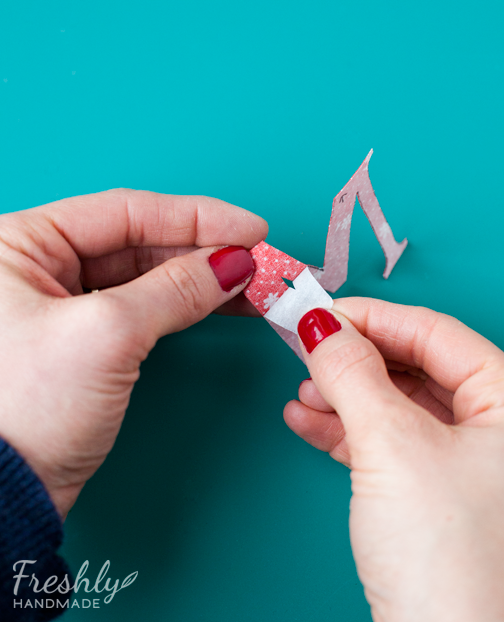 STEP 8: Using the end of a straight pin, gently score the paper on the letters, leaves and berries and remove the paper. STEP 9: Center each letter on a banner. I recommend temporarily placing the ribbon on the top of the banner so you can see where the center is once the ribbon is attached. 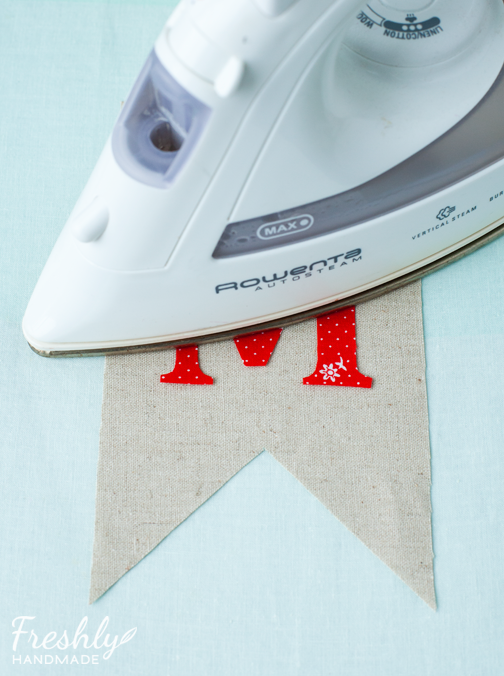 STEP 10: Fuse the letter to the banner with your iron in the same manner in which you adhered the fusible web to the fabric. 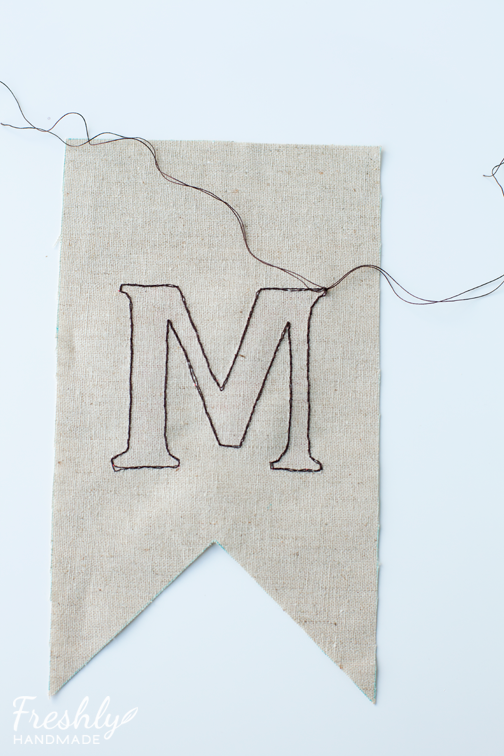 STEP 11: Using the dark brown thread, stitch around the letter catching just inside the edge of the fabric. You'll want a small stitch length. I set mine to 2. If you are new at doing this, I recommend setting your sewing machine speed to low until you get the hang of it. I went around each letter twice. 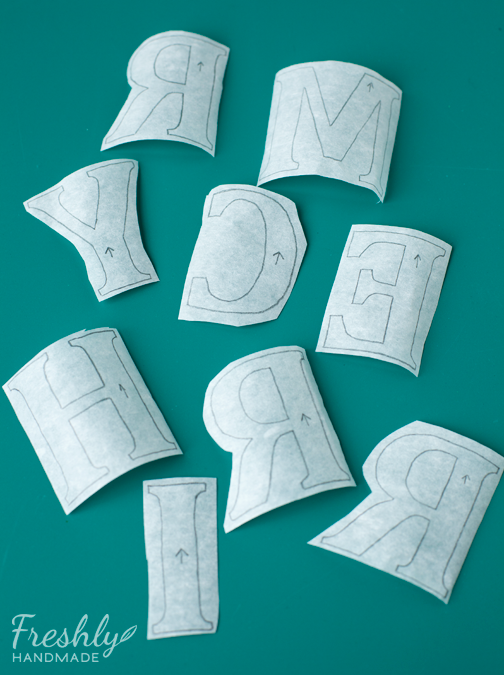 Your stitching does NOT need to be perfect, so don't sweat it if you veer off course a little. Believe me, mine are not perfect and I like them that way. 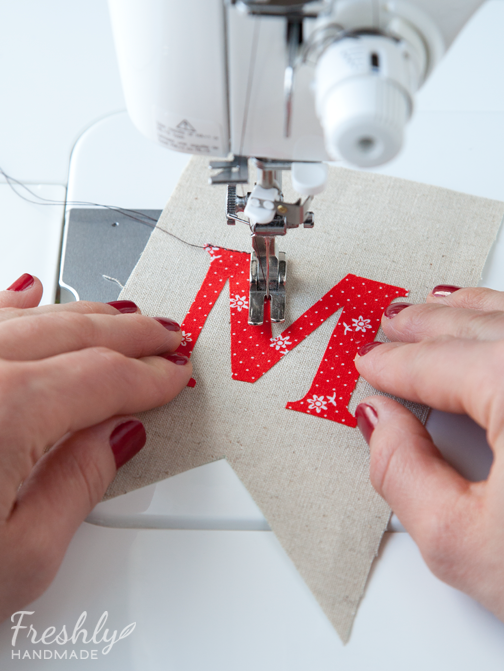 Use a hand stitching needle to bring your loose top threads to the back of the banner. Tie the threads into a knot to secure and trim. 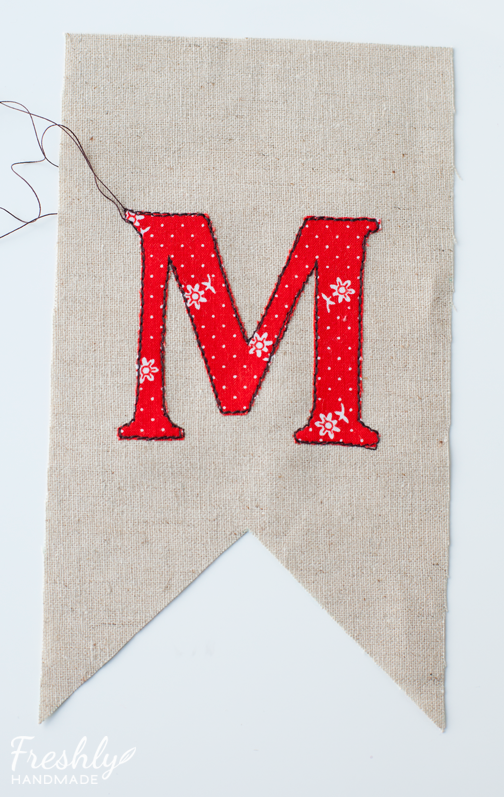 STEP 12: Stitch around the edge of the banner in the same way you did the letters. I made my stitch length a little longer for the borders and stitched approximately 1/16" to 1/8" in from the edge. Repeat these steps for all the letter banners. Here is how you will lay out the holly leaves and berries. Leaf 1 is on the left and Leaf 2 is on the right. Press to fuse the fabrics as before. Here is how you can stitch it. 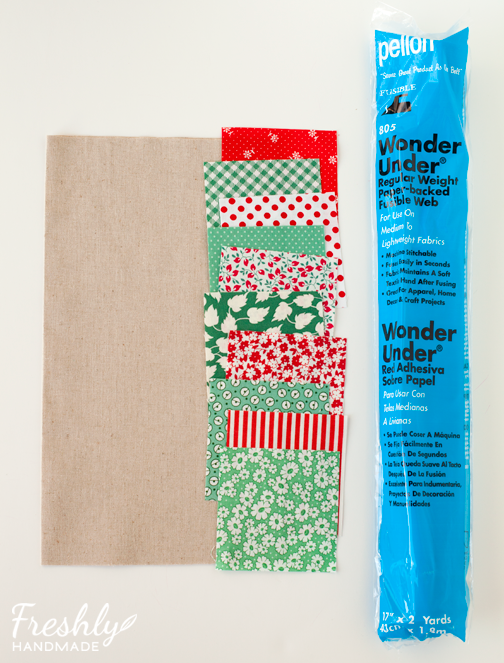 STEP 13: Take your 3 yards of ribbon and lay it out straight on a flat surface. 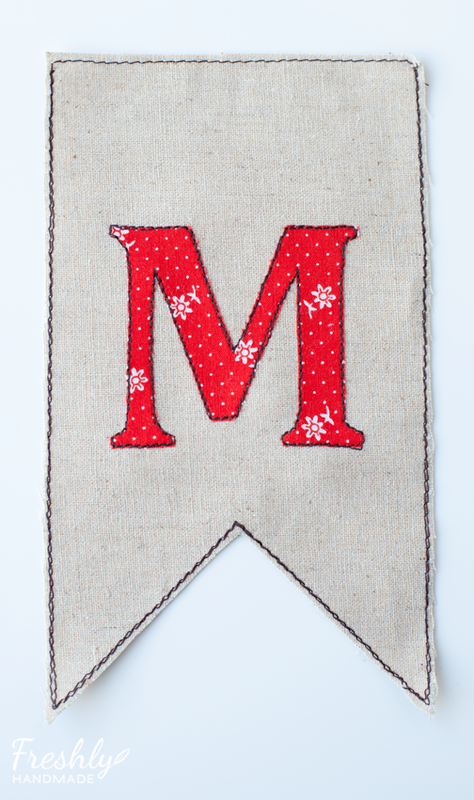 Measure in 16" and place your first banner. 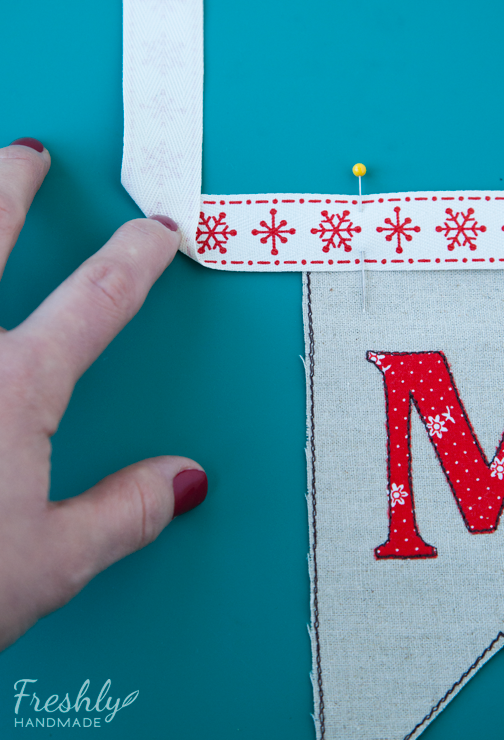 Align the top of the ribbon with the top of the banner and pin in place. Do the same for the rest of the banners, leaving a 1" space in between each banner. 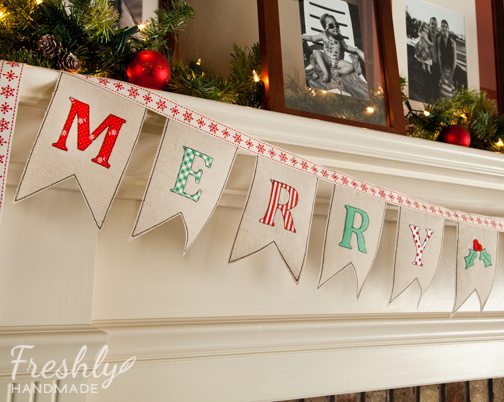 The holly leaves and berries banner is placed in between the words "MERRY" and "CHRISTMAS". 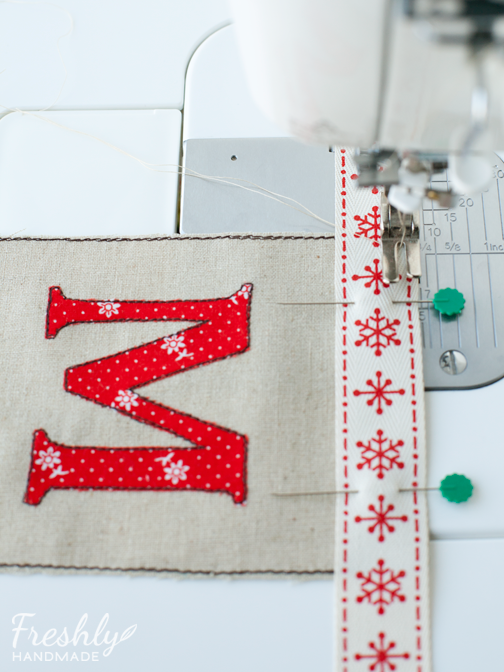 Using thread that blends with the ribbon, sew along the top and bottom edges of the ribbon along the width of the banner. Continue to sew the ribbon onto all the banners. Clean up loose threads. STEP 14: I like to force my end tails in the right direction by sewing them down, especially if I am using ribbon that is printed only on one side. 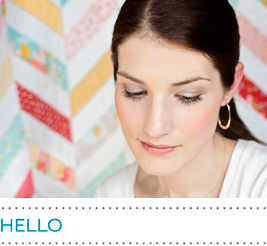 To do this, you're going to make a corner like you would if you were binding the corner of a quilt. Start by bringing the ribbon tail up and over itself to create a triangle. 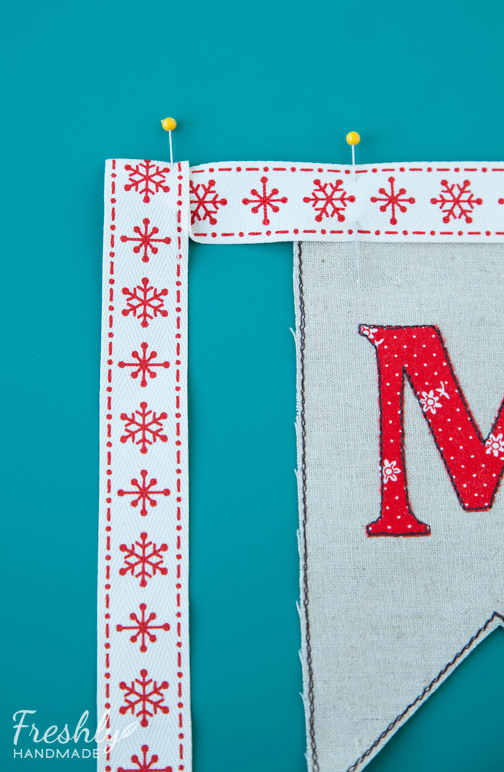 Leave about a 1" space between the banner and where you are creating this fold. 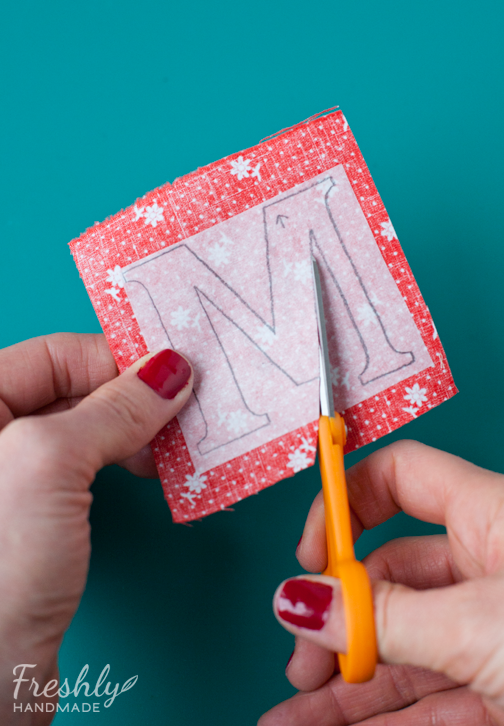 Fold the ribbon back down onto itself so that the printed side is on top. Pin in place and sew down where the ribbon layers meet. At this point, you can trim your tails to be the same length. 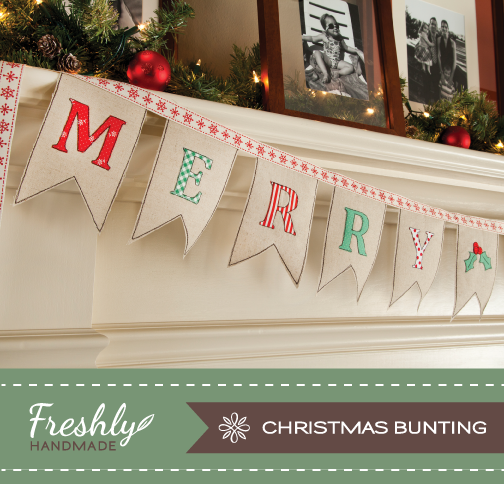 STEP 15: By this time, you've handled your bunting pieces quite a bit which means the banner tails may be curling a little. I like to spray a light coating of starch on the banners and press flat before hanging. 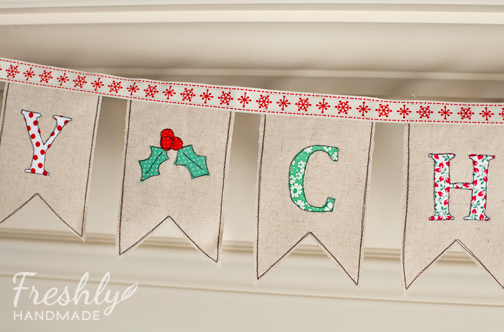 If you prefer stiff banners, you could probably add interfacing to the back side of each banner. 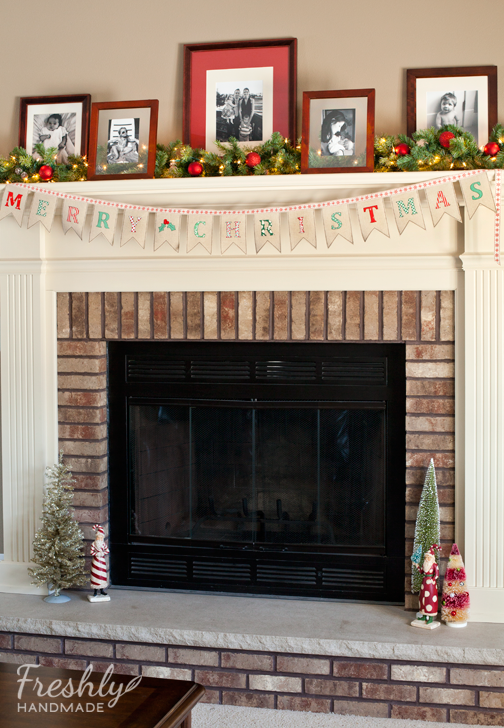 STEP 16: Turn on some Christmas music, pour some eggnog, hang the bunting (careful not to drink too much eggnog before this step or it might be crooked), step back, give yourself a pat on the back and enjoy your new holiday decoration. I love this!! Thanks for the tutorial!! 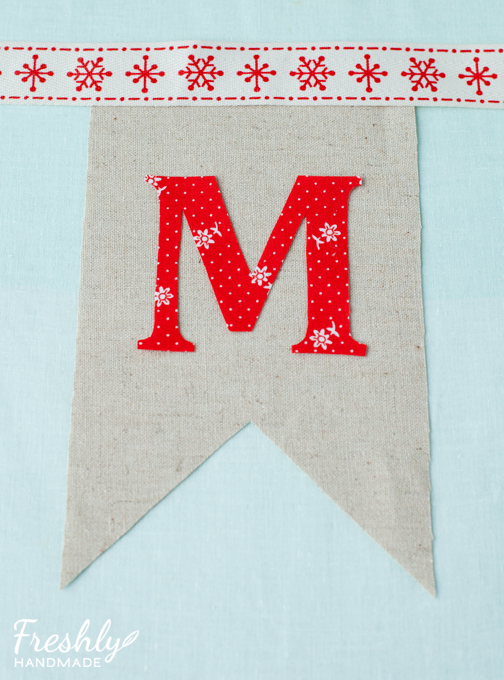 Definitely going to make this for next years bunting! !